Here’s something I’ve never told you before. All through high school, I was a lifeguard. I was a really good swimmer, and even swam in the Olympic time trials. So is it any wonder I love to paint fish and mermaids – or, for that matter, funky life guard towers. 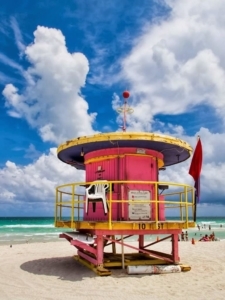 When you’re talking towers, Miami Beach is the epicenter of trend-setting odd-shaped colorful guard stations. 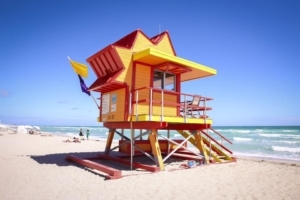 If you haven’t been, Miami’s life guard towers are known worldwide for their blazing Art Deco colors and quirky geometric designs. 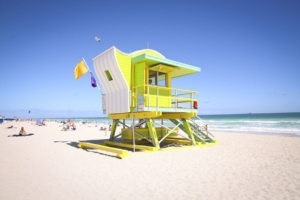 Stretching from 87th Street all the way down to the southernmost tip of South Pointe, beach goers will find a whopping 39 lifeguard towers. It’s four most recent additions were actually designed by an architect. Sounds like my kinda guy. 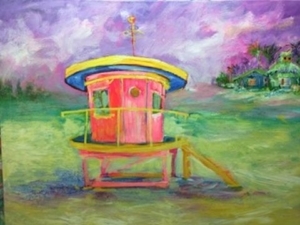 I painted my Lifeguard Tower as part of my Florida Floats My Boat series, and Bealls liked it so much, they’ve already incorporated it into some of the tees and tops in my Leoma Lovegrove line of casual wear. You need not be a lifeguard or world class swimmer to wear one of my tees. Lifeguards are in right now thanks to Dwayne Johnson, Zak Efron and Alexandra Daddario. It’s too bad I was decades ahead of my time. I coulda been a contender. I coulda given Alexandra Daddario a run for the money … or at least a run on the beach. Original artworks and less costly prints of my beach scenes and wildlife are available at the gallery. Job by or give us a call at 239-938-5655.